Michael McFadyen's Scuba Diving - Sea Lark Channel Sydney divers do not really get the opportunity to do drift dives very often. The only regular drift that I know people do in Sydney is at the entrance to Botany Bay and I believe Melbourne divers have a couple and there is one at Swansea in NSW. I do a lot of drift dives, both in Sydney and elsewhere in NSW but these are generally from a private boat. Drift dives, if properly run, can be an easy and exciting way to dive as anyone who has done them will testify. Divers who have visited Heron Island are almost sure to have done a drift dive. Overseas, one of the main dives in Palau is Blue Holes/Blue Corner which is a drift dive and on my trips to PNG nearly every dive we did was a drift dive. 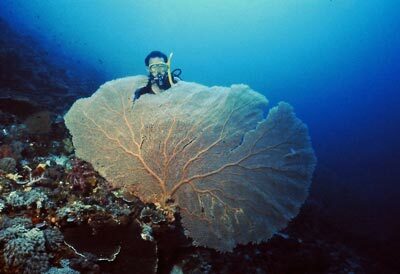 In the Solomon Islands, a site to the east of Honiara is well set up for drift dives. The site is Sealark Channel which is the main shipping channel into Honiara from the east. 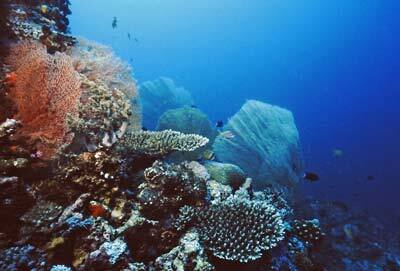 It is a leisurely 60 minute boat trip from the capital to the dive site. On an incoming tide you enter the water at the eastern end of Sealark Reef and flow with the tide. 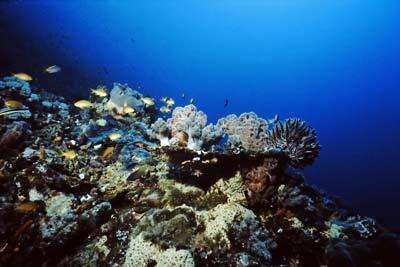 The reef here drops from the surface down to more than 30 metres a short distance off the reef. 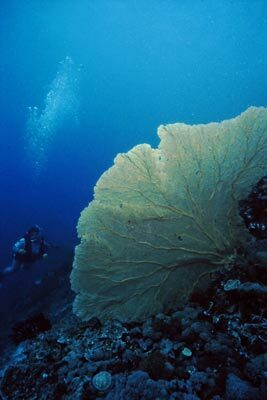 While not a vertical wall, there is a lot of coral growth and many huge gorgonias. The water drops down further away from the reef to over 300 metres. Fishlife is not overly prolific, although we saw at least one huge hump-headed wrasse. The current was very strong although generally you could swim against it for a short distance. However, on a slight bend in the reef, the current increased to such an extent that it was certainly over two knots and far too strong to swim against. Despite this, it was a very enjoyable and easy dive and provided good photographic opportunities. Some of my photos dramatically show the huge gorgonias bent over in the current although my attempts at taking photos were made difficult by the current's strength. It sometimes took two or three attempts to coincide everything at the right moment as I drifted past. After 50 to 60 minutes it is time to surface as you will be approaching the end of the reef. Visibility here was very good, in the order of 25 metres. Due to the distance from Honiara, this dive is best done as the second of a double dive that has the USS John Penn as the first. Due to the ethnic problems that started in early 1999 there was no dive operation on Guadalcanal until late 2004. 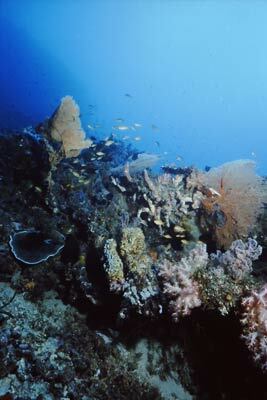 Until early 2004 you could not even visit the area where the wreck and reef are located. Since the Australian, New Zealand and other Pacific Island military forces regained control of the country (at the Solomon Islands invitation) and especially this area, the situation has changed. 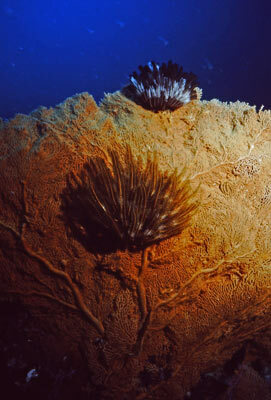 However, I have no idea if this reef has ever been dived since we did it. NOTE: Underwater photographs taken with Niklonos IV-A in 1992 and scanned 2011.